Enough of the boring topics in the previous posts. Today I am going to start my first post on Investment related topics. Most people when they hear about investment, they will say, Yes! Making Money! Is that everything about Investments? I will probably elaborate that in my future posts. But for now, before we start investment, we should first learn the basics of investments. Many Stock Bloggers in Singapore has already discussed about Fundamental Analysis and Technical Analysis, which you can easily find. While FA and TA are the most powerful tools on stocks, knowing the industry, understand the businesses of the companies and who are the management team driving the companies are equally important. For me, aside from Blue Chips, Reits, I prefer to invest in the industry that I am familiar which is Oil and Gas or Offshore & Marine. This blog is not about Stock picking but more on understanding the business and value of Stocks. Oil Majors and Exploration & Production (E&P) companies, depending on the oil price and future outlook, will plan Capex and look at which oil wells/regions to own and develop. If viable, they will survey and develop the fields and later require Oil rigs to drill and extract the oil. E.g. of Rigs operator and owners are Ezion, Transocean, Noble Drilling, Seadrill, CNOOC etc. To be honest, Ezion is more like a bare-boat charter of rigs, which means without crew. Also Ezion owns mainly specialized Liftboats which are not drilling vessels but more for well-intervention and maintenance of wells. The extracted crude oil can be process and store by an FPSO (floating production storage offload). There is only one FPSO owner in Singapore which is Ezra. Bumi Armada is listed in Malaysia while, SBM, BW Offshore, Modec etc are international players. In the whole oil developments process, there will be oil wells, valves, pipings and all sorts of construction works in the seabed. Normally, all this construction work will tender to various EPC (Engineering Procurement Construction) companies. EPC or Construction companies in Singapore include Swiber and Ezra. In Malaysia, you can find SapuraKencana, while Technip, Subsea 7, McDermott etc are international players. The water depth is a consideration for the type of vessels and equipment to use. The deeper it goes, the more complicated the technology, which means that older vessels need to be replace or upgraded. This also gives more opportunity for companies who are in the subsea segment. Brazil and Gulf of Mexico are regions where Oil and Gas are booming with many discoveries of deeper oil wells. E.g. of Singapore companies focusing on subsea are Kruez subsea which was recently sold off by Swiber and Mermaid Offshore Services listed in SGX. The Rigs or Drilling vessels and FPSO operators upon higher utilization demand for their vessels, will start to build new ones. The Rigs will be built in Keppel Fels, Sembcorp PPL or Jurong, Cosco etc. FPSO is normally converted from Oil Tankers and one of few largest in the world is Keppel Shipyard and Jurong. For newbuild FPSO, it is normally built in Korea yards like Hyundai, Daewood, Samsung etc. Then there is STX OSV who focus on building complex specialize Offshore vessels and Triyards which is a subsidiary of Ezra who typically built Liftboats for Ezion. Please note that some company will build a Rig first, and then hope to sell it sometime down the road, because a Rig typically takes 32months or more to build. This is called Speculation!!! These companies are like traders of Rigs. 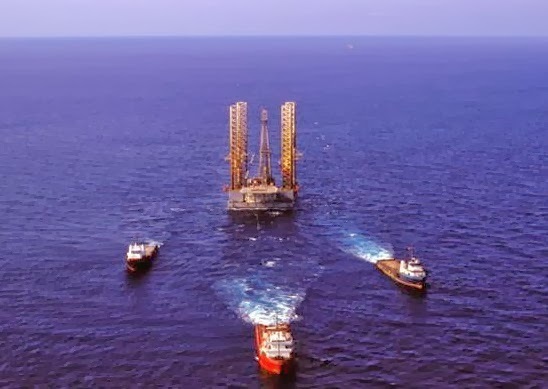 We must note the difference between “operators that own the Rigs for operational projects with their own crew” Vs “speculators who own the Rigs now and then sell it later or charter to Rig operator”. Lots of Singapore companies are involve Rig speculating in view of the recent Rigs frenzy. These companies announce to the public that they had just contracted a Rig orders, and the next moment, their share price rocketed. E.g. EMS Energy, Viking Offshore, Marco Polo lately. However one must really know what are the motives behind the stories and how it is cooked, such as who are the investors that these companies are partnering to finance the rig building and how potential is the company’s ability to sell or charter or even operate the vessels later. Otherwise Risk Element can be huge since building and owning a Rig is very different from a traditional Offshore Vessels. Operating it is even more difficult with the right crew. Similarly, building an Offshore Vessel is much more complicated than building traditional Shipping or Merchant vessels like those of NOL. For every Rig/ FPSO or EPC Construction project, they will require several offshore support vessels (OSV) or Construction vessels to complement the offshore work or to provide supplies of food, equipment, accommodation etc. OSV are typically PSV (Platform supply vessels), AHTSV (Anchor Handling Towing Supply Vessels, Maintenance Accommodation Vessels, Offshore Construction Vessels, Diving Vessels etc. E.g. are Ezra, Swiber, Nam Cheong, Pacific Radiance, ASL Marine, Mermaid Offshore, Jaya, Vallianz, Swissco, Marcopolo, Otto Marine, Falcon Energy, CH Offshore etc. Most of these companies both own ships for chartering as well as yards for building new vessels, yards for maintaining their own vessels. All the rigs, FPSOs or OSV will require lots of equipment. E.g. FPSO require topsides or modules which are mainly built in Dyna-Mac. Rigs require jacking and mooring systems which are provided by Baker Tech. Rigs have Blow Out Preventer which are serviced by MTQ. MTQ also serviced Engines and provide subsea services of ROV after acquiring an Australian company Neptune. Then there are wire rope and anchor suppliers like Gaylin, KTL Global, Teho etc. There is many other equipment supplier in the Offshore industry like Mencast, Viking Offshore, Heatec Jietong, KS energy etc. *SGD Listed companies are bold. I am trying my best to input as much as I know. Of course if you discover that some of the information is incorrect, do feel free to leave comments to share and discuss. I will be most appreciative as I am learning each and every day as well. First time posting a comment on your blog. My qualitative understanding of the O & G/Offshore & Marine sector is pretty weak even though I own a few stocks that you mentioned. Learnt quite a fair bit from this article. Thanks for the comments. Your analogy is very true. The first few blogs are most original and one of the best! I am no gurus in stocks but having worked in O&G for more than 10 years, I do know a bit about the sector! Pls focus on the facts I write and ignore my views if it is not applicable. Also do correct me if anything wrong you discover. :-) if you need any info, do email me. I will try my best to share. I read your blog too! I feel that you put in so much effort in it, and really commendable. Comments are meant to differ, we learn, but what your blog evolve is your feelings and emotions! It is so you (non-pretentious) and so original. I like it a lot. Keep up the good work and let's learn from each other to improve ourselves! I think you also put in quite a bit of effort in your posts and I am impressed by some of your analyses. Have added your blog to my blogroll as I feel my readers will benefit from your insights too. Many people like to invest in the O & G sector (one of the success stories of SG) but might not have the remotest idea of how the industry works. By the way, I added you in my blogroll too. Have a splendid day and week ahead. Am Mrs. Cathrine Brodie from United State of America, God has bless me with two kids and a loving husband, I promise to share this Testimony because of God favor in my life,2months ago I was in desperate need of money so I thought of having a loan then I ran into wrong hands who claimed to be a loan lender not knowing he was a scam. he collected 2,000USD from me and refuse to email me since. then I was confuse, but God came to my rescue, one faithful day I went to church after the service I share idea with a friend and she introduce me to ERIVAN LOAN FIRM, she said she was given 50,000USD by Mr ERIVAN , THE MANAGING DIRECTOR OF ERIVAN LOAN FIRM. so I collected his email Address ,he told me the rules and regulation and I followed, then after processing of the Documents he gave me my loan of 30,000POUNDS .you can contact him on via email (erivanloancompany@yahoo.com ) I am sure he will help you. Have you been looking for a loan?Do you need an urgent personal or business loan?I received the sum of $3,000.000 some days ago after been scammed of $8500 from a woman claiming to been a loan lender but i thank God today that i got my loan worth $3,000.000.Feel free to contact the company for a genuine financial service.They are located in Canada. Morris and Company Trust Fund Limited (morristrustfundlimited@hotmail.com) Canada +16477393756 http://www.morristrustfundlimited.com. He is a trust worthy man. Thank you sir. Have you been looking for a loan?Do you need an urgent personal or business loan?I received the sum of $3,000.000 some days ago after been scammed of $8500 from a woman claiming to been a loan lender but i thank God today that i got my loan worth $3,000.000.Feel free to contact the company for a genuine financial service.They are located in Canada. Morris and Company Trust Fund Limited (morristrustfundlimited@hotmail.com) Canada +16477393756 . He is a trust worthy man. Thank you sir. Hello Everyone i am urgently looking for positive investment opportunities and running business partnerships to invest in i have available required investment capital and looking for any investment opportunities to invest in like a silent partner i need serious business investment opportunities with positive income generating value i am looking more on long term partnership investments which have good profit margin and need additional capital for expansion . the month and bills need to get paid? Adam Fred Loan Company is the answer. Get THE 2017 BLANK ATM Programmed Card and cash money directly in any ATM Machine around you. There is no risk of being caught, because the card has been programmed in such a way that it´s not traceable, it also has a technique that makes it impossible for the CCTV to detect you and you can only withdraw a total amount of $5,000.00 USD in a day. Now email us today at our E-mail address at: blankatmcreditcard@hotmail.com and get your card today and live that luxury life you every dream to live.